Let them transport you to France’s most famous winter markets. After 4pm, when it starts to get dark, the Christmas spirit takes over the streets of The Rocks. 12 Wooden chalets will be set up around the Rocks with an array of amazing pop-up Christmas stores, food and more. 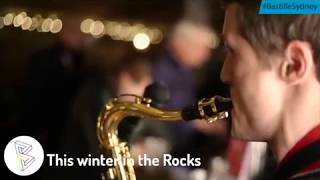 If you are looking for Christmas presents and dream of the lovely smell of a Christmas tree or the unmistakable sound of Christmas carols, The Rocks Christmas in July Market will give its lanes a little something magical. Get lost in the Rocks and let them transport you to France. Wooden Chalets imported straight from Europe. Christmas Carols, mulled wine, food and gift ideas to celebrate your Christmas in July at home.